Image © TOP IMAGE: Professor Brad Shaffer holds a Southern rubber boa. High in the San Jacinto Mountains about 100 miles east of Los Angeles, a secret slithers. Uncovering it takes watchful eyes, long nights and perseverance. But for UCLA’s Jesse Grismer, the opportunity to track down a rare Southern rubber boa has been worth the wait. His search for the elusive creature wasn’t just a scavenger hunt — it’s part of an attempt to find out if the snake is endangered. Participants in the ongoing project will conduct tests to determine if the boa is genetically distinct from its more common northern cousin. If so, that could qualify the snake for protection under the Endangered Species Act. 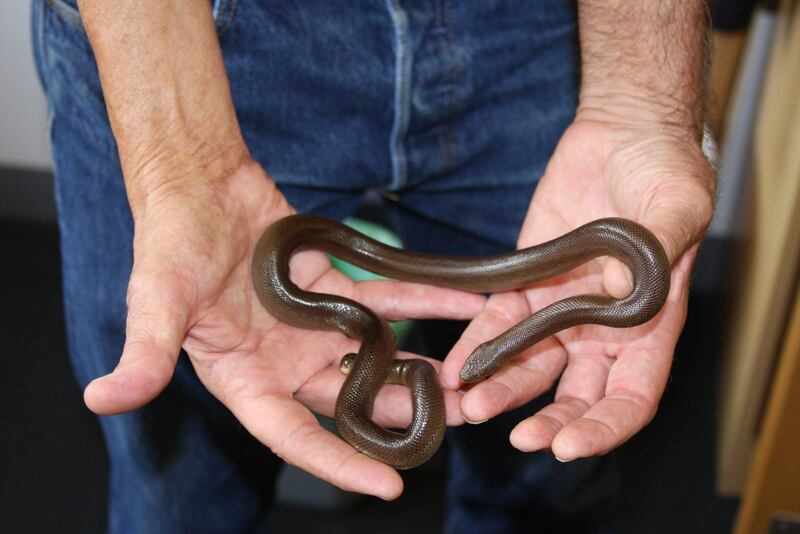 “This research will essentially see how different these lineages are, and thus the need to conserve and protect the southern rubber boa,” said Grismer, a postdoctoral scholar with the UCLA La Kretz Center for California Conservation Science. There is an alternative explanation for the southern boa’s rarity, Grismer said. Because the animals live at high elevations, hunt at night and spend a lot of time underground, they may simply be extraordinarily difficult to find. Prior to Grismer’s expedition in April, only two Southern Rubber Boa tissue samples and specimens had been collected. The San Jacinto and San Bernardino Mountains are the only areas where the Southern rubber boa has been spotted, and very few specimens are available for DNA analysis. Determined to find more, Grismer, fellow UCLA postdoctoral scholar Peter Scott, and Brian Hinds, president of the North American Field Herping Association, led a group of UCLA undergraduates on the snake quest in the San Jacinto Mountains over several days in April. “After eight hours of searching we finally found one … I couldn’t believe it, I was screaming and yelling,” Grismer said. They eventually turned up one more — effectively doubling the number of existing specimens nationwide. Still, his surveying suggests the future of the species could be in jeopardy. Charismatic endangered species such as polar bears and Los Angeles’ famed mountain lions get a lot of public attention when it comes to conservation. Snakes aren’t generally seen as cuddly, but the rubber boa makes a humble case — they never strike, and gently wrap around a person’s arm for an hour or so after being picked up. The smallest of the boas, they kill prey by constriction, primarily feeding on small mammals including mice and voles. Grismer’s work, funded in part by the United States Fish and Wildlife Service, is part of a broader effort to help the agency determine whether should be protected under the Endangered Species Act. The results of research like Grismers will provide much-needed genetic data to guide federal decision-makers. If listed, the Southern rubber boa would become entitled to several protections, most notably the requirement that people apply for an incidental take permit when planning an action that may harm the listed species. The application process involves consulting the Fish and Wildlife Service on otherwise legal activities — such as construction or economic development — to minimize and mitigate the effects on the endangered species. Brad Shaffer, distinguished professor of ecology and evolutionary biology and director of the La Kretz Center for California Conservation Science, highlighted how the listing could make individuals, particularly researchers, more carefully consider their interactions with endangered species. “When conducting research you really have to make sure, both legally and ethically, that the positive research you’re doing for the species as a whole outweighs the negative effects … the explicit goal of research is the recovery and delisting of a species,” Shaffer said.